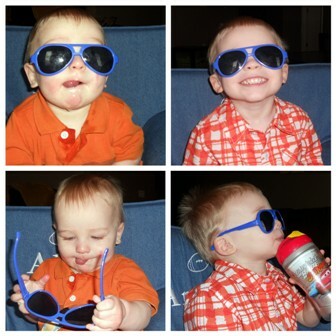 These are their "play" sunglasses from Andrew's party. They were playing with all the dress up stuff (pirates, firemen, etc) but these simple sunglasses were the big winner. Ok, and, on Alex - I just love that little tongue! He's teething - again! He has 7 teeth already! And I guess a few more are a-coming. And, Andrew - look at that hair (bottom right pic)! LOVE IT! That tongue sticking out is SO adorable! What cuties! Thanks! It cracks me up they way he does that! Those boys!! Are such little men! Very cute!!! I saw you on the link up from the simple things! I'm a very excited new follower!